A classic piece of westcoast modern architecture is back on the market again.West Vancouver—which actually lies north of the rest of the city and on the other side of the harbour—holds most of the city’s best modern architecture. This is due to unwise code restrictions everywhere else, along with other reasons, all too frustrating to go into here. Vancouver architect Ned Pratt produced work in an era that—from the standpoint of our developer-led moment—is quickly starting to look like a golden age. Pratt and Arthur Erickson along with their contemporaries Ron Thom and Fred Hollingsworth still rank among Vancouver’s best and most influential architects. 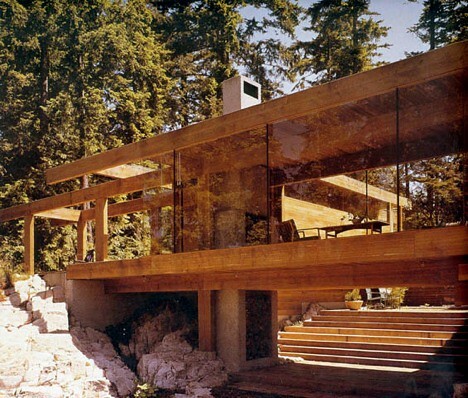 These photos of Ned Pratt’s own 1951 house in West Vancouver, BC, were taken by Foster Grant. This is by far one of my favourite houses in Vancouver. It’s in the municipality of West Vancouver, home to many of the best modern houses in the city, and it belongs to the novelist Douglas Coupland. He grew up in West Vancouver, not far from this house. Just as beautiful as this place is the house below it, a beautiful midcentury modern post and beam house designed by the architect Ron Thom. Vancouver artist Arni Haraldsson, known for his photographic studies of modernist architecture and his research on Corbusier, produced these three photographs of the house of another artist, BC Binning, in 1994. Binning, a painter, built a beautiful little modernist house for himself and his wife in West Vancouver, B.C.